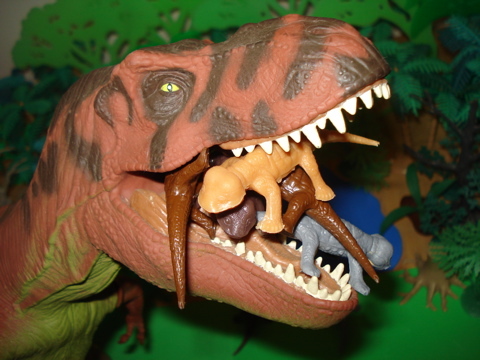 An Apex Predator among Dinosaur toys. 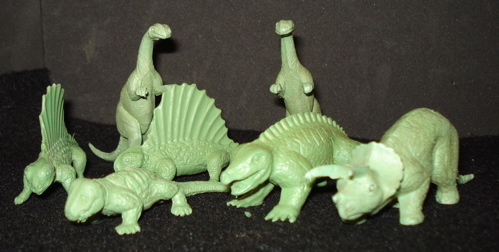 "This Should Be an Embarrassment"
In 1964 the Multiple Plastics Corporation came out with their own series of cut-rate mass produced Dinosaur toys and the MPC Cynognathus was near the head of the alphabetical line. It was clearly based on the MARX Cynognathus (which was a loose rendering of the one in Rudolph Zallinger's"The Age of Reptiles" mural at the Yale Peabody Museum) (link opens new window) which, in fact, looks nothing like the Cynognathus that we have come to know today with forty more years of scientific figgerin' behind us. A poor imitation of an odd reproduction of a misinterpretation. There are a plethora of things that I don't like about this figure. It is a poor copy, its detail is muddy (unlike the Marx) and it is hollow. I can forgive a lot of sins when it comes to a toy Dinosaur but being eviscerated isn't one of them. 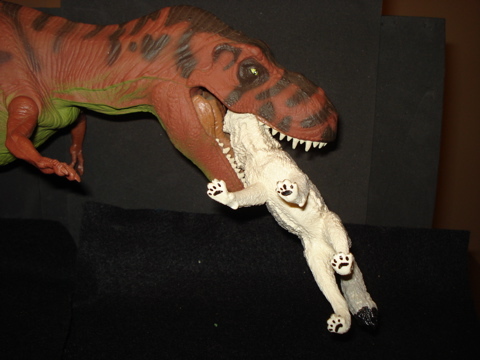 Additionally the casting wasn't that good and the position was splayed out so it looked as if a T-Rex had run it over. 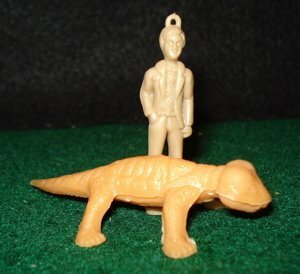 It was kind of the cockroach of Dinosaur toys. After I had done the Marx Cynognathus page I had developed a greater appreciation of those. Sadly my depreciation for these was reinforced. 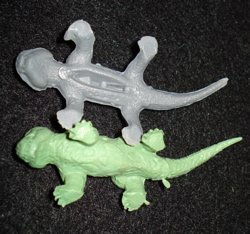 What would a T-Rex have thought of these? <"Grrrr. Tasteless-Neighbor doesn't appreciate the work I do for the Dino-site!" These confrontations occasionally lead to surprise revelations! "Mmmmm. Neighbor not as tasteless as I had thought." And so we see how a true Apex Predator tends to handle "situations" and competitors. Tasty situations, tasty competitors. 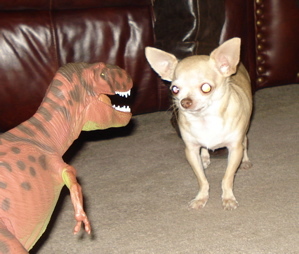 This has been the Apex Predator Dino-Blog Archive page. 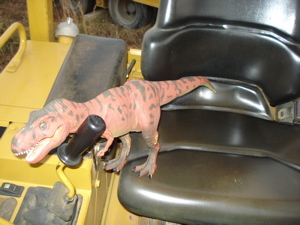 Click THIS link to return to the Dino-Blog Archives main page, thank you.